No doubt the years hunting monsters and saving the universe have had their toll on the Winchesters, but their toughest and most gruesome battles are contained in this book. Think Lucifer was diabolically clever? Think again. No son is more wayward than the one who squanders his intellect and academic career pursuing questions as poignant as “Half-awesome? That’s full-on good, right?” Gathered here for the first time since the formation of Purgatory, a collection of research so arcane and horrific that it would make even the late, great Bobby Singer blush. 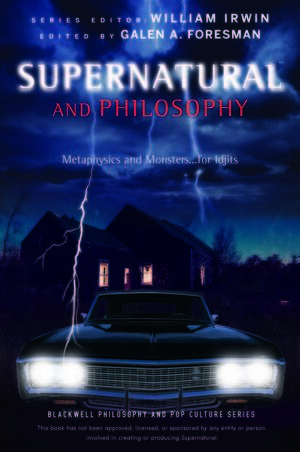 Supernatural and Philosophy tackles all the big ideas in the long-running hit show Supernatural, covering thorny issues in a fun and accessible way. Even those unfamiliar with the show will find fascinating insights into Heaven, Hell, Angels, Demons, God, and Lucifer. Galen A. Foresman is an Assistant Professor of Philosophy at North Carolina Agricultural and Technical State University, where he teaches ethics and critical thinking. He is the author of “Why Batman Is Better than Superman” in Batman and Philosophy (Wiley, 2008) and "What’s Wrong with Camping?" in Halo and Philosophy (2011). William Irwin is Professor of Philosophy at King’s College. He originated the philosophy and popular culture genre of books as coeditor of the bestselling The Simpsons and Philosophy and has overseen recent titles including Superman and Philosophy, Black Sabbath and Philosophy, and Spider-Man and Philosophy. Galen A. Foresman and Francis Tobienne, Jr.